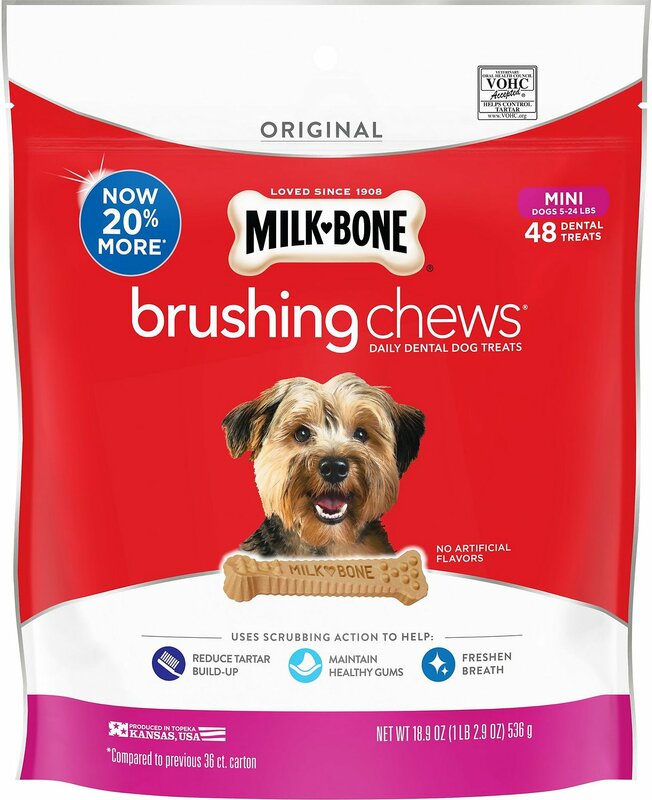 Milk-Bone Brushing Chews Daily Dental Dog Treats are made for dogs that aren’t so excited to see a toothbrush but still need to keep those pearly whites in good shape. 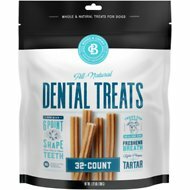 When given to your dog daily, these dental bones are as effective as brushing his teeth twice a week in reducing tartar buildup. They hold the Veterinary Oral Health Council Seal of Acceptance for tartar control, and they’re clinically proven to cut down on tartar and fight bad breath. These flexible bones have a patented design that’s made to twist as your dog chews to clean even hard to reach teeth with its bristle-like nubs and ridges. 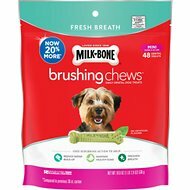 Milk-Bone Brushing Chews make it easy to provide oral care for your pup because they have a delicious chicken taste dogs can’t resist. Have a patented design that’s made to twist as your dog chews to clean even hard to reach teeth with its bristle-like nubs and ridges. Available in multiple sizes, so dogs from all barks of life can enjoy the benefits of Milk-Bone! Rice, Powdered Cellulose, Chicken By-Product Meal, Propylene Glycol, Dried Skim Milk, Modified Food Starch, Dextrin, Water, Sodium Tripolyphosphate, Bone Phosphate, Calcium Sulfate, Gelatin, Animal Digest, Potassium Sorbate (Used As A Preservative), Phosphoric Acid, Titanium Dioxide (Color), Minerals (Ferrous Sulfate, Zinc Oxide, Manganous Oxide, Copper Sulfate, Calcium Iodate, Sodium Selenite), Vitamins (Vitamin E Supplement, Vitamin A Supplement, Niacin Supplement, D-Calcium Pantothenate, Riboflavin Supplement, Pyridoxine Hydrochloride, Thiamine Mononitrate, Vitamin D3 Supplement, Folic Acid, Biotin, Vitamin B12 Supplement), Natural Smoke Flavor, Yellow 6, Yellow 5, BHA (Used As A Preservative). Feed one treat per day. Not suitable for dogs less than 6 months of age. As with any edible product, ensure the treat is adequately chewed. Gulping any items can be harmful or cause serious injury to a dog. Fresh drinking water should always be available. These are the best way to keep our Aussie's, Maggie, teeth clean. She gets them daily at 4:30 p.m. and has learned when the time has arrived. She will sit and stare at me until I get up and get it for her. She starts her vigil about 4:15 every day and waits patiently for me to respond to her wish. My two boys love these. They get one every night before bedtime and if they don't they will sit by the stairs waiting for their treat. I've used other doggie bones but these are most definitely their favorite. My dog goes crazy when I say “want a chew bone”. She runs right to the cabinet where they are kept. I alway open the pack after buying so they get nice and hard. These are great for cleaning their teeth so I always keep a supply on hand. I gave a bone to my 45lb dog. She was on the sofa & jumped down to the floor with the bone in her mouth. In 10 seconds she jumped back on the sofa w/o the bone. I got up & looked around on the floor but the bone was gone. She swallowed it whole! Not good. No more milk bones for her. I've been giving my 9 year old dog these for several years and she loves them. Our vet always comments how good her teeth look too. Great product and made in USA. 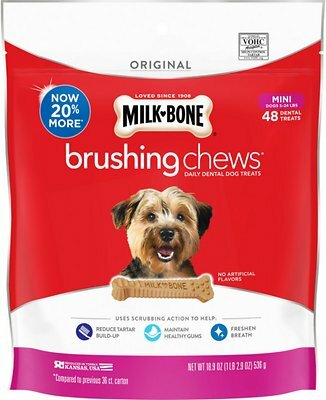 My dog hates having his teeth brushed, so I decided to get these to freshen him up in between brushings. He is only 15lbs and I break these in half. You can immediately tell the difference in smell when he is done. 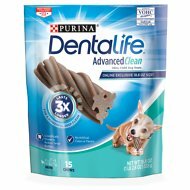 The best part is it cleans while they are chewing and because of the texture, it will keep them busy for a while. I always watch him when I give him these because he is used to gobbling down traditional milk bones. My Dogs' Favorite Part of the Day! I bought these originally just because of the reviews and because I wanted something that was a treat but also good for teeth cleaning. I had no idea my dogs would become obsessed with their after-dinner "toothbrush." My one dog inhales her dinner and comes searching for me immediately after. The other dog stops mid-meal and wants his. I'm happy to have these and I think they do help with breath. I even pack these with their meals when they have to be boarded for any reason. Definitely recommend!